To be honest, the Kipferl originate from Vienna, Austria. However, the delicious sickle-shaped cookies have been baked in Germany for Christmas for a long time. I can't think of a Christmas without Vanillekipferl. Believe me, they melt in your mouth! Before we start with the recipe, here is one hot tip! For Christmas baking (but also for any other cakes and desserts) make you own vanilla sugar. It has much more aroma and flavour than commercially produced vanilla sugar. Put approximately 200g sugar into a screw-top jar, slice one Vanilla Bean, remove the pulp with a small spoon and cut the bean into 2 or 3 pieces. Add pulp and the vanilla bean pieces to the sugar. Close the jar and shake well. Let the vanilla sugar rest for a few day, shake occasionally. 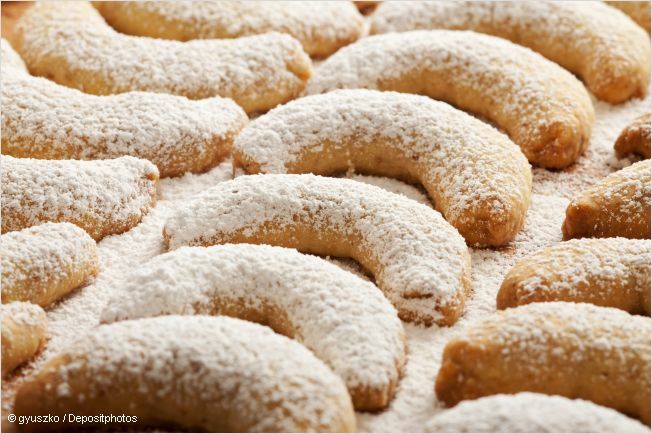 Almond crescents belong to the quick and easy Christmas cookie recipes. I am sure, you and your family and friends will love the result! Mix the butter, salt, vanilla sugar and egg yolk in a bowl using a hand mixer. Sift the flour, add ground almonds and flour to the butter mix, and quickly knead a firm dough. Divide the dough into quarters and form four rolls, each one about 2 to 3cm (0,78 zo 1,18 inch) thick. Cover the rolls with cling wrap and cool them for about an hour. Flour the worktop and cut the rolls into slices (about as thick as a finger) and form little crescents. Put the Kipferl on a greased baking sheet, or a sheet lined with parchment paper. Bake at 160°C / 320°F in a pre-heated oven for 12 to 15 minutes. Remove the almond crescents carefully with a palette knife. Fill the icing sugar into a small bowl and dust the Kipferl while they are still warm. Let the cookies cool completely on a cooling rack. 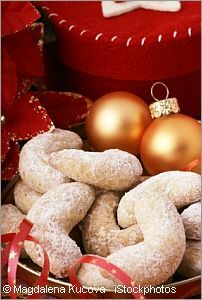 Vanille Kipferl are a wonderful little gift to bring when you visit family and friends during the Christmas season. Don't you agree?